First off, congratulations on your pregnancy! The next step is finding the best baby registry. Which baby registry is best? When looking for the best place for baby registry, there may be a few places that you might already have in mind. Amazon is one of the best baby registry sites. It has one of the biggest selection with over 270,000 baby items and you can easily add items from ANY site. One of the biggest benefits of Amazon baby registry is that after you complete your baby registry, you get 10% off select remaining items, or upgraded to 15% off for Amazon Prime Members, compliments of Amazon Family (which is a great program, especially for diaper and formula shopping). Items eligible for discount include items in the Baby, Beauty, Maternity, Toys, Grocery, and Drugstore departments shipped and sold by Amazon or Fulfilled by Amazon. You are eligible for this Amazon baby registry completion discount 60 days prior to the arrival date selected on your registry and at least 14 days after your registry was created. You can use this discount on up to 2 orders of $2,000 combined for up to 60 days after your expected arrival date. Another huge benefit of using Amazon’s baby registry is that you can add products from any website, not just Amazon. This makes it a great one-stop universal registry compared to other places. For example, if you find something on the Target or Buy Buy Baby website that you want, you can simply add it to your Amazon baby registry by just clicking a button. This universal feature is very helpful because you wouldn’t want to have more than one registry. The last thing we want is to make it difficult for our friends and family. With Amazon Assistant, you can shop smarter online and make better decisions. Get order updates, product comparisons, watched deals notifications, and more! Other Amazon baby registry benefits include their free, fast shipping on orders of $25+ or free for Amazon Prime Members and its easy 90-day returns on almost all items purchased from your registry. The gifter can ship gifts directly to your chosen Amazon Baby Registry address. Amazon also offers an automatically generated Thank You note to send to all your gifters. So whatever is on your baby registry list, you can pretty much find them on Amazon, including baby bottles, car seats, strollers, baby mattresses, baby cribs, baby monitors, and more. Plus, prices tend to be cheaper, or fairly reasonable, compared to other places. Amazon Prime members (30-Day Free Trial ) who create a baby registry are eligible for other rotating limited time offers such as a Welcome Box, free parenting eBook, maternity savings, discounts from Tiny Prints, and more! In fact, Amazon is one of the best places to register for free baby stuff. To get ideas for your baby registry must-haves, you can use Amazon’s handy Baby Registry Checklist and search through other registries for inspiration. You can browse through the most popular baby registry gifts as well as find lists of top-rated baby products. Amazon is known for their many user reviews so it’s helpful to read them. There are plenty of pictures and even videos that shows you how the product is used. The downside to Amazon’s baby registry is that not everyone shops online. Some people prefer to buy from physical stores. However, even if you have people buying items not from Amazon, they can log onto Amazon and indicate which items they purchased. With Amazon universal baby registry, you can easily find and keep track of everything you need for your baby in one convenient place. You can download the Amazon Mobile App, which allows you to update your registry anytime and anywhere. 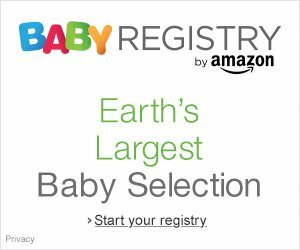 All in all, Amazon is one of the best places to register for baby! To create baby registry on Amazon, simply click here. Babies”R”Us is one of the top baby stores so it is no wonder that their baby registry is also very popular. In fact, it is one of the best places for baby registry. They offer nice perks, including you up to 10% back on purchases from your registry, including your own purchases. The more gifts you receive, the more you’ll earn! There are no limits on how much you can earn. Get 5% on the first $300 spent and 10% on everything above that! You will receive an eGift Card for your total earnings about 12 weeks after your baby’s expected due date. You can use the gift card to buy anything you want on Babies “R” Us with no exclusions! This means that if the total amount spent was $2,000, you will get a $185 gift card. That’s a nice chunk of savings! Babies “R” Us offers a 15% Registry Completion Discount Certificate, which is a coupon that you will receive in the mail after completion. You can use the coupon in-store or online on any items remaining on your registry but it’s a one-time use coupon so think carefully before making your purchase! One of the biggest benefits of Babies R Us’s baby registry is their generous return policy. They accept returns for store credit up to 1 year after your due date for most items on your baby registry as long as they are in its original packaging. This means that items that you once thought you needed but did not use will not go to waste after all! Babies “R” Us also offers one-on-one registry consultation, where you can get expert advice from your Personal Registry Partner to help you choose the best items for your baby. You can also join other parents at an in-store event or class. It’s a great way to meet new parents and make new friends! Their in-store events feature an informative, fun-filled schedule. Events include Baby’s First Christmas, Baby’s First Birthday and more! You just need to make an appointment online. Another great thing is that Babies “R” Us will price match anything from other stores, including Amazon, but it needs to be an in-store purchase. They have over 750 stores so you can go to their stores to see, touch, and even test drive! Babies “R” Us offers free shipping on all online purchases of $29 or more. You can download the Babies “R” Us mobile app to shop, discover new products, create and manage your registry, receive notifications and more! The downside to registering on Babies R Us is that their selection isn’t as wide as Amazon’s and their prices tend to be more expensive compared to other places. To create a baby registry on Babies “R” Us, become a Rewards “R” Us member and register for everything you’ll need for your baby, even the items you plan to buy yourself. Target is one of the best universal baby registry, where you can add the items you want from other websites. With over 1,800 locations in the USA, almost everyone has a Target store nearby. This makes it convenient to visit a store to browse or even return gifts. They have a wide selection of baby items, such as diapers, formula, car seats, clothing, toys and more. Your guests can shop your registry online and ship directly to you for free if their order is $35+ or pick up the order at a store near them for free. Target baby registry benefits include a 15% off completion coupon after you create a registry, which will come in the mail 6 weeks before your due date for items not yet purchased. This is great because it allows you to buy anything else you might need before your baby arrives. Similar to the Babies “R” Us coupon, it is a one-time use coupon. Target allows group gifting, which makes it easy for gifters to contribute toward larger items. Similar to Babies “R” Us, one of the biggest advantages of using Target’s baby registry is their their generous return policy. They accept returns and exchanges up to 1 year after your due date for most items on your baby registry as long as they are new and unopened. A nice thing is that Target will price match if you buy a qualifying registry item at Target but then find the same item for less at Target.com, select online competitors, or in a Target’s or a competitor’s local print ad. You can download the Target registry app to scan barcodes and easily manage your registry from anywhere. You can add items, review your registry checklist, see what items have been purchased and by whom, and more! If you are asking yourself, “what stores give free gifts when you do a baby registry?” make sure you create a registry at Target! You will also receive a Target Welcome Kit for $50 worth of coupons and handpicked samples. Click here to create your baby registry on Target. Buy Buy BABY is amongst the popular baby registries. They are owned by Bed Bath & Beyond and the nice thing about that is those 20% off coupons that Bed Bath & Beyond always sends can also be used at Buy Buy Baby! If you don’t get those coupons, you can easily sign up here at Bed Bath and Beyond. Even though the discount is off only single item, a 20% discount on an expensive item is still quite nice. Buybuy BABY has a large selection of baby essentials and offer guidance and resources help you with your questions. You can schedule an in-store appointment with one of their expert Registry Consultants to help you create a personalized registry. Buybuy BABY will send you a completion coupon for use in stores in the mail several weeks before your stated due date. The discount seems to vary between 10-15%. You will also receive a second completion coupon for use online in your email a couple of weeks before your stated due date. You can use this coupon to shop for any remaining items on your registry. So, make sure you keep your mailing address and email address up to date. One of the biggest advantages of registering with buybuy BABY is their hassle-free returns, which never expire. Even if you have lost the receipt or packing slip, you can bring the item into any of their stores and an associate can look up the item from your registry and process the return. When you register at buybuy BABY, you can get free stuff like their Goody Bag, which is full of great samples and coupons. It is available for pick-up in stores. If you register in-store, you’ll also get free announcement cards to let your friends and family know that you’re registered at buybuy BABY. Similar to Target and Babies “R” Us, they also do a price match. Read their specific terms regarding their price match guarantee. You can use buybuy Baby’s Interactive Checklist to get suggestions and ideas for items to put on your baby registry. You can also use their Registry Favorites to view their most popular items by category and see items that other parents love. You can even ask your friends and family to help you build your registry with Ask a Friend and Copy a Friend’s registry tools. If you want to add an entire curated list, you can do so in just a couple seconds. Buy Buy Baby also has a friends referral program, where if you refer them to buybuy BABY or Bed Bath & Beyond and they create a registry, they will send you a coupon for $25 off any in-store purchase of $100+. The only downside is that there aren’t as many buybuy BABY stores compared to Babies “R” Us or Target stores. Overall, BBB’s registry is not bad. Some people like it better than Babies “R” Us but in the end, it really comes down to what’s most convenient for you and your friends and family. Click here if you want to create a registry with buybuy BABY. Pottery Barn Kids has some really beautiful items. They are also high quality and durable, but comes with a price. For example, it wouldn’t be a surprise to see gliders or dressers for $1,000. However, if your friends and family are comfortable with the prices, then you can consider registering at Pottery Barn. With Pottery Barn Kids, the price you’re paying for is for the quality and their nice styles. For example, their bath towels are soft, cute, and you can even customize it to put your baby’s name on it. They also offer a nice selection of organic bedding and GREENGUARD Gold Certified furniture. Pottery Barn offers a 20% completion discount on your remaining registry items but, unlike most registries, it only begins AFTER your baby’s due date. However, you can use this discount toward unlimited purchases at any time for up to 6 months after your event. You can continue to add things to your registry during that time and it includes non-baby items and furniture! You also get 10% off any multiple-purchased items. For example, if you are buying 2 of the same bedding or blankets, you can get 10% off. This can be great if you have twins. Pottery Barn Kids has only a 30 day return policy for a full refund, but all monogrammed/personalized items are final sale. Pottery Barn offers free decorating services if you need help decorating your nursery either in your home or in one of their stores. Unfortunately, there are not as many Pottery Barn Kids stores as Target or Babies R Us stores. Take a look at their registry must-haves to get some ideas for your registry. They have great customer service and their furniture has been safety tested to the highest standards. You can create your Pottery Barn registry here. Read reviews before registering for products. Amazon has many user reviews from parents who have tried these products out and giving their unbiased opinions. Include products ranging from different price points. Don’t feel guilty if you put a few expensive items on your list. Someone, or even a group of people might pool in their money and take joy to buy you what you need. Add everything that you need, not just the items that you want other people to buy for you. Include practical items like baby shampoo, diapers, wipes, nursing pads, and more. Most stores offer a completion discount once you register with them. It’s nice to get a percentage off items that you buy from your list after your arrival date has passed. Get inspiration from baby registry checklists. Don’t think short-term. You can even register for toddler items such as bigger car seat or a potty seat. Remember, newborns grow up so fast and before you know it, you’ll be ready for high chairs, bath toys, and trikes or ride-ons. Make sure you register early as you want to give your guests time to shop for you. Don’t feel pressured to register for everything you might need all at once. You can start simple and add on as your baby grows. Don’t go overboard registering for clothes and toys, as you’ll most likely have enough of those. These are the “fun things” that many people like to purchase these on their own, even without them being on your registry at all.